We have to go some way back on Mugspotters to glimpse a rare sighting of what is now known as ‘The Americano’. We were blessed with CIDs effort back in November 2012 and this piece, rather than sporting a printed promo sheath for placement on a generic cup, they opt for the print to go directly on the vessel. Unlike the cool logo on their website, the mug is simply one colour on white. But beware – its sheathless form may make it very hazardous to handle when filled with a hot beverage. This was a Charity Shop salvage item and I swear when I popped the lid off, it was like breaking the seal on a jar of Kenco Rapport. (probably the worst instant, just a grade above Mellow Birds!) I was hit by a wave of cheap coffee aroma from it’s permeated innards but at least it was dry and clean. 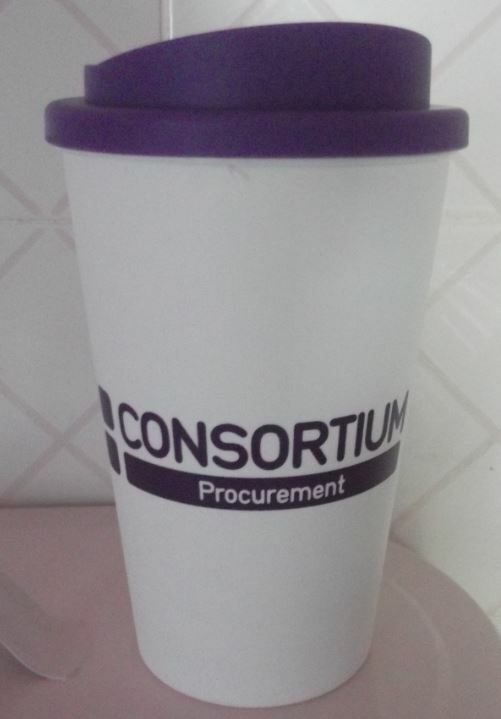 As for Consortium Procurement, having checked out their web presence I am a bit nonplussed as to what they do other than act as a conduit for Housing Associations. Their ‘Americano’ though is a worthy addition to our annals and bolsters an already criminally under-represented genre in the world of Trade Mugs.